So the clothes remained as new, it is important not only to wash but also dry. After all, if the right to hang linen, this will make it easier Ironing. 1. 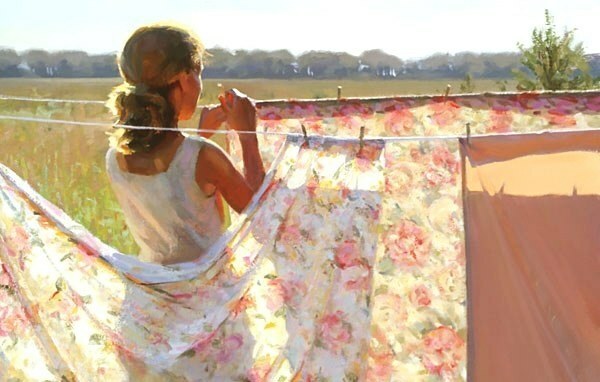 Stretched a clothesline must be not only clean, but also durable, so that it is not torn under the weight of damp clothes. You need to pull it tight and before each hanging of linen to wipe with a damp cloth. 2. Clothespins or clips to hold the pocket in advance or attach them to a clothesline, you can also the old-fashioned way to keep them attached to the rope at the waist or the neck (in a necklace), so it will be convenient to take them and attach to the underwear. After drying always remove the clothespins in a bag. 3. Try to put similar things near. Need to hang so that the edge of each piece was bent using a clothesline to 10-20 cm. 4. Knitted things to hang, bending them in half through the rope. Shirts, pillowcases, sheets, pants is allowed to dry on the left side. 5. Before hanging must be well spread all things, but it should be done carefully, so that in drying they are not stretched. The seams and ribbon unroll, it will greatly facilitate their further Ironing. 6. Inside out turn things back, shaking them and giving them a normal shape.